Your baby’s first test, because the best protection you can give is early detection. Newborn screening is recognised all over the world as a form of preventative health care. Newborn screening tests babies in the first few days of life for selected genetic and metabolic diseases that are often not apparent at birth. These congenital (from birth) diseases can progress rapidly to severe illness if not detected early and treatment started. Severe complications such as brain damage and possibly even death, can be prevented by this simple test. 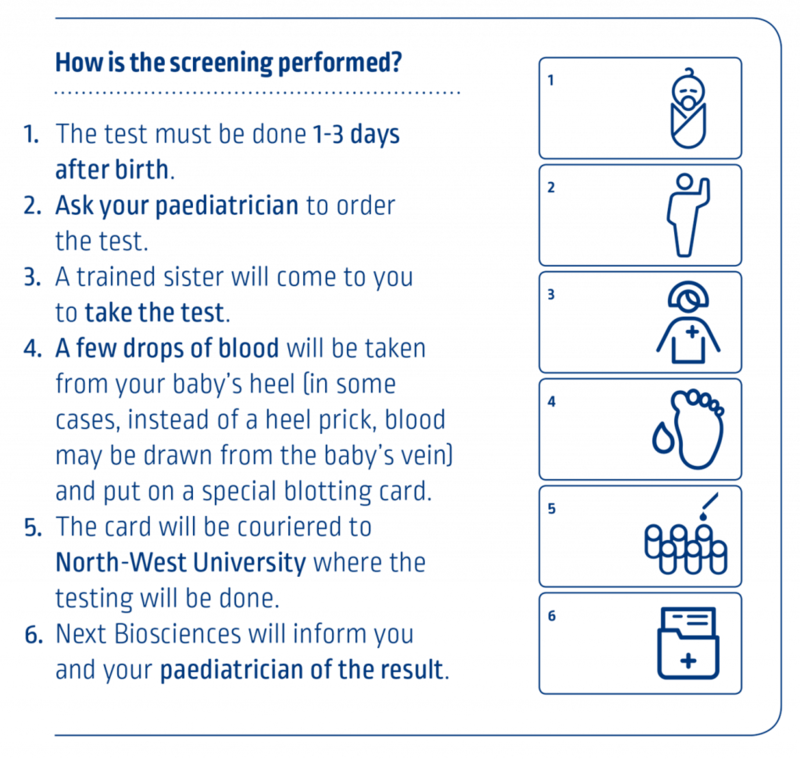 Next Biosciences offers FirstScreen – a newborn screening test done in collaboration with North-West University, and includes tests relevant to the South African population. Babies with metabolic disorders may look healthy at birth. Early diagnosis can prevent debilitating complications. The test is safe, not harmful. Test only requires a few drops of blood from your baby’s heel (in some cases, instead of a heel prick, the sample may be drawn from the baby’s vein). The false positive rate was up to 10% however with the new Precision NBS, this will decrease to less than 1% over the next two years. In some disorders, there is a problem in the transport and usage of nutrients, which can also lead to the development of a disease or disorder in body chemistry. Newborn screening tests are designed to pick up these diseases and disorders before any harmful effects set in. As most affected children show no sign of the disease at birth, the tests have to be done within 24 – 72 hours of birth. Amino acids are the building blocks that make up proteins in our food. A number of different enzymes are needed to process these amino acids for our body to use. A problem with these enzymes means that the body cannot utilise the amino acids properly, and they can build up to dangerous levels in the body and cause damage to the brain, or liver or other organs. These disorders also involve faulty enzymes in protein metabolism. The body cannot utilise the proteins properly resulting in a build-up of harmful substances that affect the organs of the body. The body uses fat to create energy, which is essential for growth and normal development. The body’s process of breaking down fat is called “fatty acid oxidation” and involves a number of enzymes. Problems with these enzymes will cause fatty acid oxidation disorders, and affected children will not be able to breakdown fat from either food or their own body fat stores. Milk, which is baby’s first food, contains a sugar called galactose. Disorders involving enzymes that breakdown galactose can cause a build-up that is extremely toxic to the body. Hormones are our body’s chemical messengers, sending messages from one place to another and regulating various processes in the body. Hormones are made by the endocrine glands such as the thyroid, the ovaries, the testes and the adrenal glands. Biotinidase Deficiency is an inherited condition in which the body is unable to reuse and recycle the vitamin Biotin. Because the body needs free Biotin to break down fats, proteins and carbohydrates effectively, individuals with Biotinidase Deficiency are less able to process important nutrients. Children with Biotinidase Deficiency who are identified through Newborn screening and begin treatment immediately usually remain healthy with normal development. Biotinidase Deficiency occurs in 1:60 000 live births, most common among people of European descent. Cystic Fibrosis (CF) is one of the most common inherited (from both parents) childhood diseases. It is a disorder where there is a problem in the regulation of movement of water and salt in and out of the body cells. The result is a body’s inability to properly secrete fluids like sweat, tears, digestive enzymes and mucous. The fluids become thick, and cause blockages in parts of the body like the respiratory tract, pancreas, intestine, liver, sweat glands and male genital tract. Should all newborns be screened? Since we do not know which child may be at risk of a metabolic disease, international practice recommends that all children undergo newborn screening. By testing all children, we’re assured of finding the few that are affected, for whom early detection and treatment of the disease is vital. When should newborns be screened? The ideal time is between 24 and 72 hours after the birth, but up to a week after birth is still acceptable. The baby needs to have had a few feeds and started the digestion and metabolism of proteins, carbohydrates and fats (all found in breast milk and formula milk) to bring the disorder to light. Tests done outside the ideal timeframe may still be useful, but they become less accurate. What does it mean if the test must be repeated? Sometimes, the laboratory at North-West University will request that the test be repeated. It does not necessarily mean there is anything wrong with the baby – it may be that the sample was not collected properly, and not enough blood was available for testing. With the new Precision NBS, the re-test rate will decrease from 10% to 1% over the next two years. What if my baby’s result is abnormal? If something is found to be abnormal with the results, a repeat test, and sometimes additional blood and urine tests, may be required. Don’t be alarmed by the request for further testing, as it doesn’t mean that there’s definitely something wrong with the baby. Often, when the first test suggests a problem, the results cannot be considered final until a repeat test is done. This requires a new blood sample. The doctors at Next Biosciences and your paediatrician will discuss the need for further tests with you. When will I know the results of the test? You will be notified of the result within 7 -10 working days of the test being done. What happens if my baby is diagnosed with a disorder? If a test comes back positive for any of the disorders, your paediatrician will contact you immediately. Each disorder is treatable in its own way, even though they’re not curable. Your paediatrician will guide you through the explanation of the disease, and the ways in which it can be treated. Next Biosciences is also able to organise a genetic counsellor to counsel you about the implications of the disease. In most instances, treatment consists of dietary modifications, dietary supplementation, hormones and sometimes medication. If your baby has one of these conditions, it is very important that treatment is started as soon as possible. Are there risks involved in NBS? The baby will feel little discomfort during the collection procedure and may cry a bit. The testing is not harmful at all.